NavajoYES believes that trails are a major element of the wellness revolution and we strive to promote trails in communities and tribal parks around the Navajo Nation. Trails are a key element in the promotion of a healthy lifestyle, community wellness, ecotourism and family togetherness. NavajoYES has been involved with trail restoration and promotion since the 1990’s, including years of work by our youth crews on the Rainbow Trail to Rainbow Bridge near Navajo Mountain, Arizona/Utah. These trail teams have done ongoing maintenance, restoration work and trash abatement on this sacred route. Beginning in the 2000’s, NavajoYES became the caretaker of the Twin Falls Trail near T’iis Nazbas, Arizona, and have hosted numerous trail work weekends to Twin Falls. 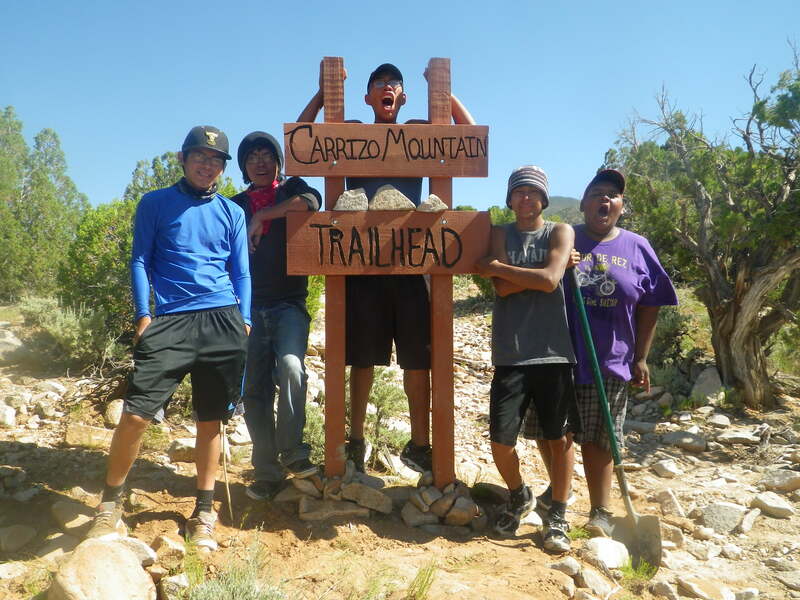 We were excited to spearhead the development of the Navajo Nation Trail Team in 2015. With support from the Division of Natural Resources, Navajo Parks & Rec, Office of Navajo President and Vice President, Engineers Without Borders and Southwest Trail Solutions, grassroots efforts have flourished throughout Dine’ Bikeyah. The Trail Team is a core group of dedicated trail advocates which meets bi-monthly in communities around the Nation. The mission of the Trail Team is to work with local communities on their projects and assist them in meeting their challenges. Since 2016, we have also hosted the annual Navajo Nation Trails Conference in February. A big welcome- and Thanks- to the folks at Osprey Packs, who are helping outfit young hikers!